1933 Buick Registry works to provided a place for owners of 1933 Buicks to come together and talk about the cars they so do love. Also on our site we provide photos of other members cars, A world wide registry and our products. In our products section we offer both new and old parts. For the old parts we have original parts that we have found all across the us just for 1933 Buicks. 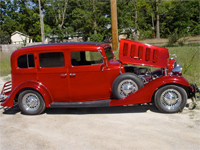 In our new parts section we have new hand crafted parts that are made just for the 1933 Buicks. These parts are one of kind made only by us..